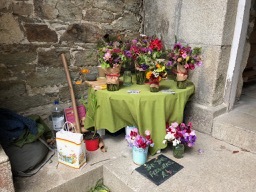 On August 12th I went to a ‘Bee Fayre’, which is an annual weekend event held at Enys Gardens in Penryn, Cornwall. It was a haven for bee fans, filled with stalls selling every bee themed product you can think of, from honey ice-cream, breads and cakes to soaps to cosmetics to beekeeping equipment. There were also short talks… I’m a bit sad I couldn’t go on the Saturday too, as I missed an eclectic set of talks about making Truro bee friendly, the Help for Heroes bee project, Cornish cider, encouraging young people to become bee farmers and beekeeping in the Scottish borders (presumably from a beekeeper on holiday!). Anyway, here’s my notes from Rodger Dewhurst’s talk. Rodger and his wife Carol run Gwenen Apiaries (Gwenen is the Cornish word for honey bee). Rodger started beekeeping all the way back when he was a twelve year old school boy, in the Lizard peninsula. He told us beekeeping was different back then, as there was more unimproved grassland around. Now more honey bees are imported and many more pests and diseases have been introduced. 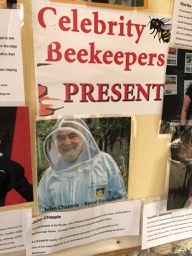 Rodger’s beekeeping has changed over the years too. Nowadays he aims to breed Cornish dark bees, Apis Mellifera Mellifera. He has also mainly stopped using smoke and gloves. He looks for a variety of characteristics in the colonies he breeds from – hygienic cleaning and grooming behaviours, including biting him! – which he takes as a sign that they will bite varroa too. Also good temper, good honey production and flying characteristics – ‘maritime bees’ that will fly in wet weather. Another anti-varroa trait he looks for is what he calls the ‘geriatric shuffle/shiver dance’ – a motion in which the bees agitate their abdomen to dislodge varroa mites. On the monitoring boards under the hives he looks for dented varroa mite shells, a sign that the mites have dropped through after being bitten at by the bees. He puts the cells in ‘apidea’, special little hives for queen-rearing, containing a mugful of nurse bees which happily rear the queens. These go to mating apiaries in a few different Cornish locations. Once the queens are mated, he will sometimes put multiple caged queens on top of a colony to see which virgin most of the bees prefer to cluster round. He makes a note of those as ‘Alpha’ queens to breed from. Endearingly, apparently the best drones have “big hairy bums”, because the native Apis Mellifera Mellifera drones are larger. They also fly later in the year than other imported sub-species of Apis Mellifera. The day finished with a Bumblebee Safari led by staff from the Bumblebee Conservation Trust. It had been sunny up till the end of the day when the Safari started, at which point the Cornish mizzle began coming down. That didn’t put the hardy bumblebees off though, and we found plenty of them enjoying a large lavender patch. It was good to see small children getting to stroke a male bumblebee and overcome their previous fears. Have you been to a talk or event recently which you’d like to write about for the website? If so get in touch, we’d love to feature more posts by members. Ever wondered whether your bees are Italian, Buckfast, Carniolan or near native? Researchers are offering Cornish beekeepers a unique opportunity to have their bees DNA tested, with the option of also taking part in a citizen science project. Researchers at the University of Plymouth are aiming to take DNA samples and analyse colony characteristics of nearly 300 Cornish Bee hives. This is an opportunity to take part in one of the most detailed DNA testing and phenotypic surveys of bees ever conducted in England. Once firm details are known then group secretaries and members will be informed accordingly as to the new procedures. Change will undoubtedly cause confusion, be patient! A selection of honey judging themed pictures from our AGM in 2016.